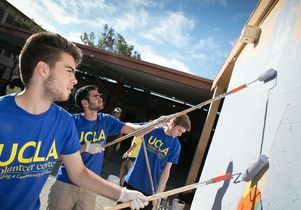 UCLA students volunteer at South Los Angeles school. 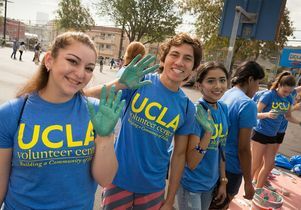 With more than 113,000 applications for fall 2018 freshman admission, UCLA has set a record for most applicants, driven in large part by a historic increase in applications from California high school students. Applications from prospective in-state freshmen jumped to roughly 71,400, an increase of approximately 7,900, or 12.5 percent, over last year. This jump marks UCLA’s largest year-to-year increase in applications from California residents, surpassing the previous record set last year. 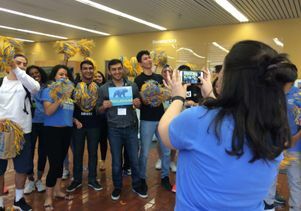 This year’s increase in freshman applications from Californians exceeded last year’s total growth in overall applications from in-state, out-of-state and international students combined. 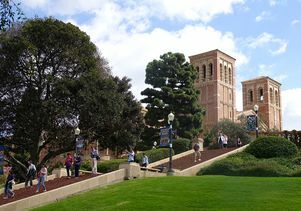 More than three of every five freshman applicants to the UC system (62.5 percent) applied to UCLA. The increased volume for California residents also includes jumps in applications from students from groups that have been traditionally underrepresented on campus. Applications from African-American high school students increased by 13 percent, while applications from Chicano/Latino and American Indian high school students increased by approximately 10 percent and 6 percent, respectively. She added that the strong numbers from underrepresented student applicants are a testament to UCLA’s robust engagement in the community. 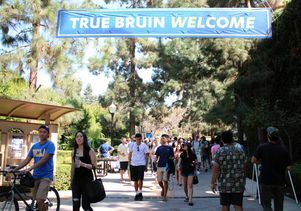 Applications from prospective Asian Americans and white freshmen from California also rose by about 17 and 7 percent, respectively, making this the most economically, ethnically and geographically diverse pool of talent ever to apply to UCLA. 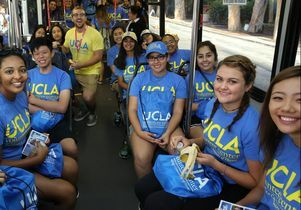 Overall, UCLA received a total of more than 137,000 applications from high school seniors and transfer students from other colleges, combined, an 11 percent jump compared with last year. Among transfer students, applications grew by 8.3 percent overall to 23,630, with a 9.2 percent increase from Californians. Transfer applications from underrepresented students who attend community colleges in California also rose, with a 12.5 jump in applications from African-American transfer students, a 19 percent increase for American Indians and a 16 percent increase for Chicano/Latino students. As part of Volunteer Day 2016, UCLA students went to Hoover Street Elementary School and painted. Students paint a wall at Mann UCLA.